Food production – the vast gains achieved over the last century, and the still-greater gains needed to feed a growing world population — is dependent on the availability of nitrogen in a chemical form that food grains and other plants can readily use. Millions of metric tons of reactive nitrogen entering the U.S. environment each year. Source: Reactive Nitrogen in the United States…A report to the EPA Science Advisory Board. 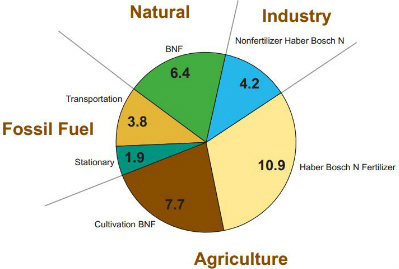 Paradoxically, the synthetic manufacture and application of nitrogen fertilizer causes significant water and air pollution. Burning fossil fuels releases the same form of nitrogen and causes the same problems for the environment and human health. On Thursday, Oct. 4, the Freshwater Society and the University of Minnesota College of Biological Sciences will sponsor a free public lecture on the excess nitrogen issue. Otto Doering, a Purdue University agricultural economist who chaired the committee of scientists that wrote the 2011 report to the EPA’s Science Advisory Committee, will deliver the lecture. His talk is titled Excess nitrogen: A Confounding Problem for Energy Use, Food Production, the Water We Drink and the Air We Breathe. Register to attend the lecture. Read a q-and-a interview that Freshwater conducted with Doering. Read a PDF of the 140-page report from the EPA committee he led. Between Nov. 27 and Dec. 14, the Minnesota Environmental Quality Board will hold six meetings around the state to seek comment from citizens on the environment, environmental review and the state’s economy. In an executive order last November, Gov. Mark Dayton directed the EQB to “evaluate and make recommendations for improved environmental governance and coordination.” Dayton also directed the EQB to prepare an “environmental and energy report card” examining the state’s performance and progress on protecting air, water and land. In February, the EQB is planning to host an Environmental Congress that will examine that report card and recommend future policy. As part of that whole process, the EQB has scheduled public-comment sessions in Rochester, Bloomington, Duluth, Worthington, St. Cloud and Moorhead. Learn more about the process and get the schedule of the meetings. A year ago the Pagami Creek fire roared across a trail to the canoe landing at Isabella Lake, an entry point on the southern edge of the Boundary Waters Canoe Area, as 40 mph wind gusts drove the blaze an unprecedented 10 miles in one day. Last summer’s fire scorched 145 square miles of forest, mostly in the Boundary Waters area. In the fall, the burn area was filled with charcoal-black trees and soil, but tiny blades of grass had started to poke through the ash. Today, the trees still stand like black pipes, their exposed roots clawing the ground. But the forest floor is lush and colorful, with moose maple and wild sarsaparilla. Despite a striking amount of new growth, forest managers have major concerns, among them a huge loss of organic matter and the presence of invasive plants that already are taking root. It is one of the oldest environmental battles in the United States, and it involves one of the country’s most famous national parks, one of its most liberal cities, leaders of Silicon Valley and a perennial source of conflict in California: water. In 1913, Congress approved the construction of a dam and an eight-mile-long reservoir, called Hetch Hetchy, in the northwest corner of Yosemite National Park to supply cheap water to San Francisco. But the Hetch Hetchy Reservoir, which submerged a valley that many have likened to Yosemite Valley in its grandeur and is credited with giving birth to the modern environmental movement, has lost none of its power to arouse strong emotions. In November, San Francisco will vote on a measure that could ultimately lead to the draining and restoration of Hetch Hetchy Valley — and force the city to look elsewhere for most of its water. The U.S. and Canada renewed a 40-year-old Great Lakes environmental pact, pledging stepped-up efforts to reduce pollution, cleanse contaminated sites and prevent exotic species invasions. The updated Great Lakes Water Quality Agreement binds both nations to continue a cleanup and restoration initiative begun when the freshwater seas were a symbol of ecological decay. Many of their beaches were littered with foul algae blooms and dead fish. The Cuyahoga River, which flows into Lake Erie in Cleveland, was so choked with oil and chemicals that flames erupted on its surface in 1969. The pact calls for further action on problems that inspired the original agreement three years after the embarrassing river fire and a second version in 1987. It pledges to “restore and maintain the chemical, physical and biological integrity” of the five lakes and the portion of the St. Lawrence River on the U.S.-Canadian border. Four environmental groups filed a lawsuit against San Bernardino County and an Orange County water district to challenge a controversial groundwater mining project in the Mojave Desert. The crux of the lawsuit is the question of which agency should serve as lead on the Cadiz Valley Water Conservation, Recovery and Storage Project, which would pump 16 billion gallons of groundwater per year from ancient aquifers. The Center for Biological Diversity, National Parks Conservation Association, Sierra Club San Gorgonio chapter and the San Bernardino Valley Audubon Society contend the county should have led the environmental review of the project, not the Santa Margarita Water District in Mission Viejo, which has signed on as a future buyer of the water from Cadiz Inc.
Minnesota farmers are putting in drain tile at a breakneck pace, according to the Pioneer Press. Read the article by Dennis Lien and David Orrick. The report notes that in the Bois de Sioux Watershed District, one of the few places in the state where accurate data on the extend of tiling are available, 1558 miles of new tile were approved last year. At today’s high commodity prices, tiling is one of the best investments farmers can make to increase yields. But environmental critics say the tiling allows marginal land to be taken out of wildlife habitat and converted to corn and soybeans, and that drainage increases riverbank erosion. Minnesota farmers have an opportunity to receive federal payment to take – or keep – highly erodable land out of crop production. The U.S. Department of Agriculture’s Farm Service Agency in Minnesota has announced a sign-up for up to 11,200 acres of erodable land eligible for payments under the Conservation Reserve Program. Offers of land to receive payments under the program will be accepted until Sept. 30 or until the acreage allotment is filled. “CRP is a voluntary program that has protected environmentally sensitive land for more than 25 years,” said Linda Hennen, the Farm Service Agency’s executive director in Minnesota. “This initiative will accept offers with an erosion rate of at least 20 tons per acre per year for new cropland or CRP acres that expire on September 30, 2012; however, existing grass stands that are not considered expiring CRP will not be considered eligible,” she said. Producers are encouraged to contact their local FSA service center or visit FSA’s website for information regarding CRP. In case we need another example of the disturbing ramifications of extreme drought for our future water security, we can look to recent news out of northwest Texas. The High Plains Water District, based in Lubbock, recently reported that the 2011-12 drought drove groundwater levels in its sixteen-county service area to drop an average of 2.56 feet (0.78 meters) – the largest annual decline recorded in the last 25 years and more than triple the annual average for the last decade. The lesson: as droughts intensify, our depletion of groundwater will pick up speed. More than 100,000 acres of environmentally sensitive Minnesota farm land are likely to be removed this fall from the federal Conservation Reserve Program that pays farmers to idle land for 10 to 15 years. Much of that land that now is planted in grass will be growing corn or soybeans next spring. The return of the land to row crops will continue a trend occurring in Minnesota, and across the country, since 2007. And the trend – driven by federal budget constraints and high commodity prices that induce farmers to choose cropping over the yearly federal conservation payments – is likely to continue for the foreseeable future. “We’re looking at potentially losing 750,000 more acres in Minnesota within the next five year,” said Bill Penning, the supervisor of the Minnesota Department of Natural Resources prairie habitat team. The U.S. Department of Agriculture announced recently that it has approved 99,000 acres for re-enrollment or new enrollment in CRP in Minnesota. But that is only about one-third of the 290,000 acres on which CRP contracts expire on Sept. 30, the end of the federal fiscal year. The exact amount of land that comes out of CRP on Sept. 30 will be determined by how many farmers with land in a small subset of the program decide to remove from the conservation effort many relatively small tracts of land dedicated to practices that include stream buffers, uncropped wellhead protection areas, windbreaks and living snow fences. Land idled for those kinds of practices currently totals about 43,000 acres in Minnesota. All of that land could stay in CRP, but it is likely some of it will come out. “It’s going to be well over 100,000 acres that’s going to come out of the program,” said Matt Holland, senior field coordinator for Pheasants Forever in Minnesota. Across the country, CRP acres peaked at about 36.8 million acres in 2007. In 2008, Congress capped national participation in the program at 32 million acres. The USDA has predicted that the current CRP enrollment of about 29.6 million acres will decline to 29 million in the new fiscal year. Minnesota participation in CRP peaked at about 1.8 million acres in 2007 and has slowly declined since then to about 1.6 million this year. To view state-by-state data on CRP contracts this year and over the next years, click here, then scroll down to CRP Contract Expirations by State, 2012-2018. The U.S. Department of Agriculture announced on May 25 that the agency had accepted farmers’ requests to enroll 3.9 million acres of environmentally sensitive land into the Conservation Reserve Program next year. Those acres, which farmers will be paid to take out of production, will be more than offset by more than 6 million acres scheduled to come out of the CRP program on Sept. 30. Read the USDA news release. A Des Moines Register article said Iowa will have a net gain of about 13,000 acres in the conservation program. Information on the amount of Minnesota farmland going into, and coming out of, the CRP program was not immediately available. Nationwide about 30 million acres of farmland are currently in the CRP program. The nation’s food supply may be vulnerable to rapid groundwater depletion from irrigated agriculture, according to a new study by researchers at the University of Texas at Austin and elsewhere. The study, which appears in the journal Proceedings of the National Academy of Sciences, paints the highest resolution picture yet of how groundwater depletion varies across space and time in California’s Central Valley and the High Plains of the central U.S. Researchers hope this information will enable more sustainable use of water in these areas, although they think irrigated agriculture may be unsustainable in some parts. Read an important Associated Press interview with John Linc Stine, the new commissioner of the Minnesota Pollution Control Agency. In the interview, Stine talks about agricultural runoff in the Minnesota and Mississippi rivers and prospects for copper-nickel mining near the Boundary Waters Canoe Area. Read a New York Times article on oil drilling in the Arctic Ocean. Shell is scheduled to begin test drilling off the Alaskan coast in July. Do you follow news about soil and water conservation, especially in agricultural settings? Take a look at SWCS Conservation NewsBriefs and consider subscribing. It is an electronic digest of new items published for members of the Soil and Water Conservation Society. A Minnesota pollution-control panel has approved the dumping of 13.5 tons of taconite concentrate into a Chisago County lake to battle high levels of weed-producing phosphorus. The Minnesota Pollution Control Agency Citizens’ Board gave the Rush Lake Improvement Association clearance Tuesday, May 22, to go ahead with the experimental project. The pollution-control board added a few stipulations, though, after some members openly wondered why such a review, called an environmental assessment worksheet, shouldn’t be conducted. The lake association has been trying for years to reduce levels of phosphorus, a nutrient that promotes algae growth when present in elevated concentrations. Common sources include animal waste and fertilizer. The Interior Department announced a plan to allow periodic increases in the flow of Colorado River water through the Grand Canyon, alleviating the environmental disruption caused by the construction of the Glen Canyon Dam in Arizona in the 1960s. The secretary of the interior, Ken Salazar, said the plan would allow the river’s managers to release excess water — more than twice as much as average flows — through and over the hydroelectric dam at will to help propel silt and sediment downstream into the canyon. By mimicking the river’s original dynamics, Interior Department officials said, the flows could help restore the backwater ecosystems in which native fish are most at home. The goal is partly to enhance sandbars that create backwaters for an endangered fish, the humpback chub. The excess sand also nourishes beaches used by wildlife, hikers and rafters. Underground water in 57 percent of monitoring sites across Chinese cities have been found polluted or extremely polluted, the Economic Information Daily, a newspaper run by Xinhua News Agency, reported, quoting figures from the Ministry of Environmental Protection. The MEP statistics also suggest that 298 million rural residents do not have access to safe drinking water. In the first half of last year, of the seven main water systems in China, only the Yangtze and Pearl rivers had good water quality, and the Haihe River in north China was heavily polluted, with the others all moderately polluted, according to the MEP. As a child, Barb Feltz spent her days along the Little Plover River, fishing for trout, playing in the water and muck, hunting for critters. Some years, those memories are about all that’s left of the Little Plover. As an adult she’s seen the water disappear, leaving a dry creek bed in 2009 and taking with it the opportunity for others to enjoy nature and form memories, like she did while growing up. A new study by Rutgers University finds that New Jersey’s coastal waters are not as polluted as scientists had thought. Marine scientists studying pollution-sensitive sea creatures on the ocean floor since 2007 found their numbers and types indicate healthier water conditions than expected. The study involved scooping small animals from 153 ocean floor sites along New Jersey’s 127-mile coastline from Sandy Hook to Cape May. There’s a lot of soil erosion so far this spring around Clarke McGrath. The Iowa State University Extension field agronomist near Harlan in western Iowa says it’s the worst it’s been in that area about 2 decades. It’s come from a combination of factors, he says. First, rainfall has been spotty and extremely variable in that area, as it has been in many parts of the Corn Belt this spring. Long dry spells have been dotted with heavy rains, making for optimal erosion potential. “We’ve had such unpredictable wild swings in weather. Rainfall, when it comes, seems to have amped itself up. We got 6 inches in 3 hours the other night. It’s been coming hard and fast,” he says. So, Mother Nature’s definitely done her fair share. But, so have farmers. This year’s early start to spring has helped, McGrath says, but the way farmers have used their time this spring has worsened the erosion potential. “We’ve done more tillage this year than any year I can remember. When we do any kinds of tillage on these highly erodible soils, it’s going to loosen that soil up and it’s going to make it susceptible to erosion,” McGrath says. The Minnesota Department of Agriculture has $20 million available for low-interest loans to help farmers and rural landowners finance projects that prevent or reduce water pollution. The funding is made available through the MDA’s Agricultural Best Management Practices (AgBMP) Loan Program and is available in all counties in the state. The AgBMP Loan Program works with Soil and Water Conservation Districts and local governments to help farmers, rural landowners and agriculture-related businesses solve pollution problems by offering loans at three percent interest through participating local lenders. All practices that reduce water pollution are eligible, such as fixing septic systems, replacing contaminated wells, upgrading livestock facilities, constructing erosion control structures, purchasing conservation tillage equipment, improving chemical application and storage methods, and adopting other water-related best management practices. The AgBMP Loan Program is based on a revolving loan structure where repayments from existing loans are reused to finance new loans. By continually revolving the repayments, the $70 million appropriated to the program has provided $170 million in loans to help finance projects costing more than $268 million.